There’s a lot to be said for one week stage races. The good ones are concentrated versions of a grand tour with a varied mix of terrain and stage types. The brevity of the contest means every mountain stage counts and there’s rarely time to recover from mistakes. 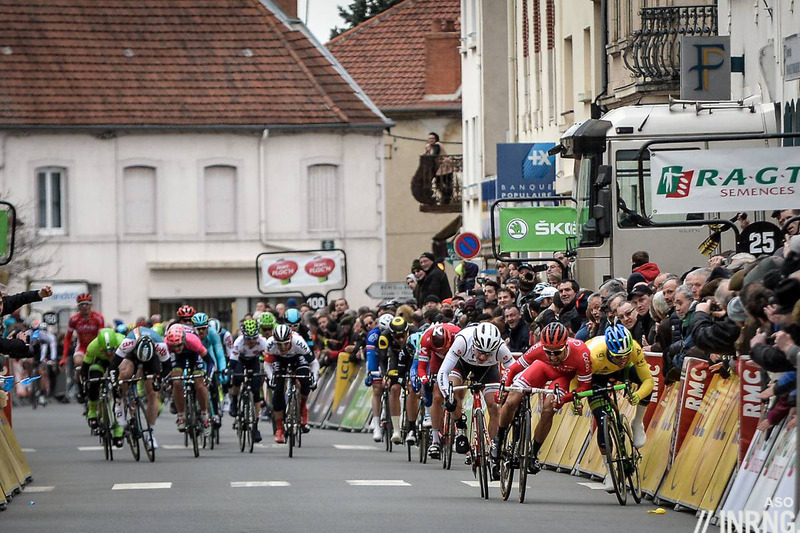 This year’s Paris-Nice was a textbook example and the final stage saved the best for last. Stage 7 is the pick but we need to review what had happened events on the way to Nice. The race began with a time trial victory for Michael Matthews ahead of Tom Dumoulin and Paddy Bevin, a result which put the Australian in the yellow jersey from for most of the week with a a second stage win after he survived a tangle with Nacer Bouhanni. We had the novelty of two gravel sectors on Stage 1, a way to turn a transitional sprint stage into a mini spring classic. 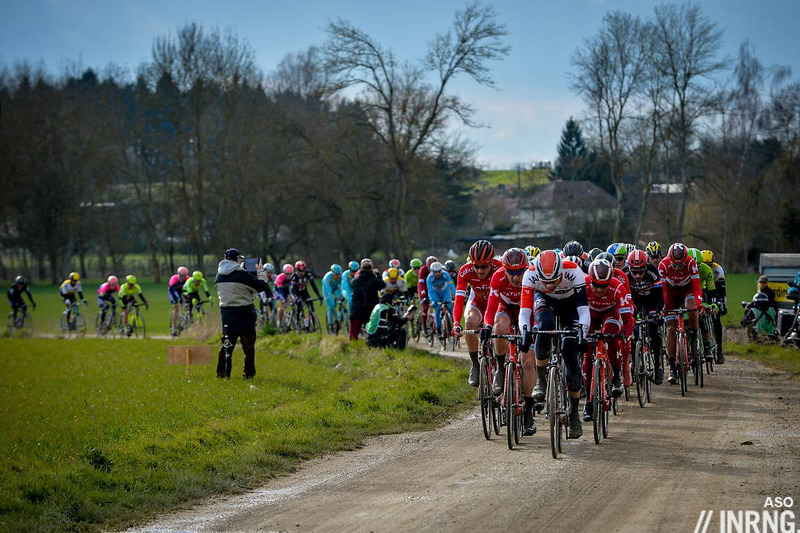 The gravel – the fear of the gravel? 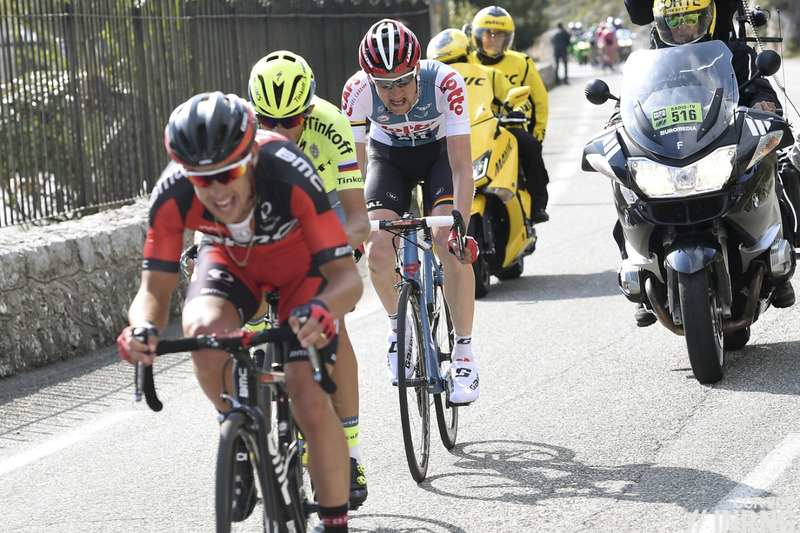 – and a light breeze was enough to get Team Sky on the front with 45km to go to rip things up as Katusha missed the move and we got an hour of action that culminated in Arnaud Démare’s long sprint. The weather was dire. 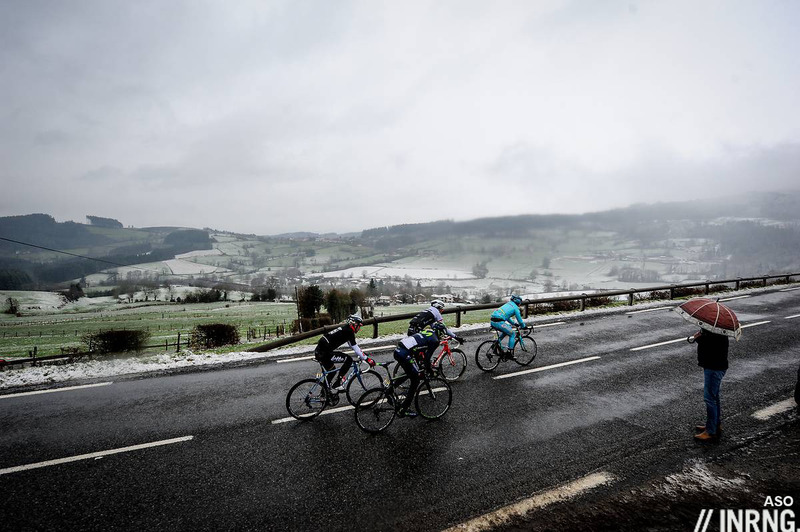 You can cope with the rain or the cold but their combination is grim and there’s no race-style clothing around to stop icy rain chilling riders to the bone. The stages could be shortened to abbreviate the agony but many ride this race to rack up long distances in the legs ahead of the classics. The weather was so bad that the mini-summit finish on the steep Mont Brouilly was abandoned as the snow fell across the Beaujolais hills activating the new Extreme Weather Protocol. This would impact the race as it kept the overall classification in a tight group. Ilnur Zakarin won the first mountain stage at the Madonne d’Utelle after sitting in the wheels and sitting out the attacks, a triumph of linear pacing. Richie Porte and Alberto Contador traded attacks, the Spaniard had gearing problems and couldn’t get the big chainring. Geraint Thomas was there with help from team mate Sergio Henao and the Welshman finished second on the stage, took the six second time bonus and was in the yellow jersey with a 15 second lead over Contador and one stage to go. Stage 7 was 134km into the hills behind Nice. Contador only needed to take back 15 seconds so what did he do? He set his team to work early, got riders in the early breakaway and then launched his solo bid with almost 50km to go. Bridging across to his team mates on the Col de Saint Pancrace Sky had to chase for the next 25km and pulled Contador back just as they reached the foot of the final climb, the Col d’Eze. 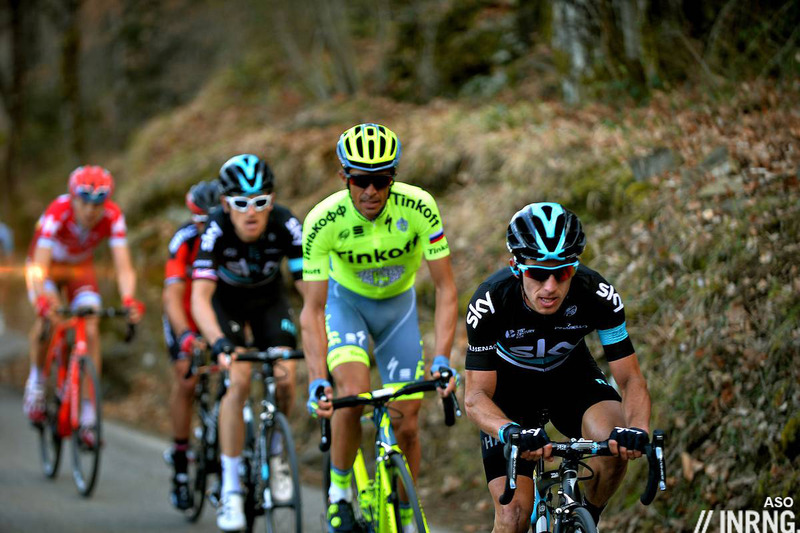 Here Contador launched more attacks and finally cracked Thomas. He crossed over the col with Richie Porte and a 30 second advantage on the yellow jersey. The pair picked up breakaway survivor Tim Wellens to begin a 15km downhill run to the finish. Contador was virtual yellow jersey and chasing the stage and time bonus. Who was going to win? Wellens took the stage win he deserved, Contador grabbed bonus seconds but the overall result wasn’t known until Thomas crossed the line and as we added time bonuses and looked to the clock he’d kept his yellow jersey by four seconds. Contador may have finished where he’d started the day in second place but he’d enlivened the race and ennobled the value of Thomas’s win. 20/20 Hindsight: another Team Sky stage race win? Yes but this was not the tactical steamroller. 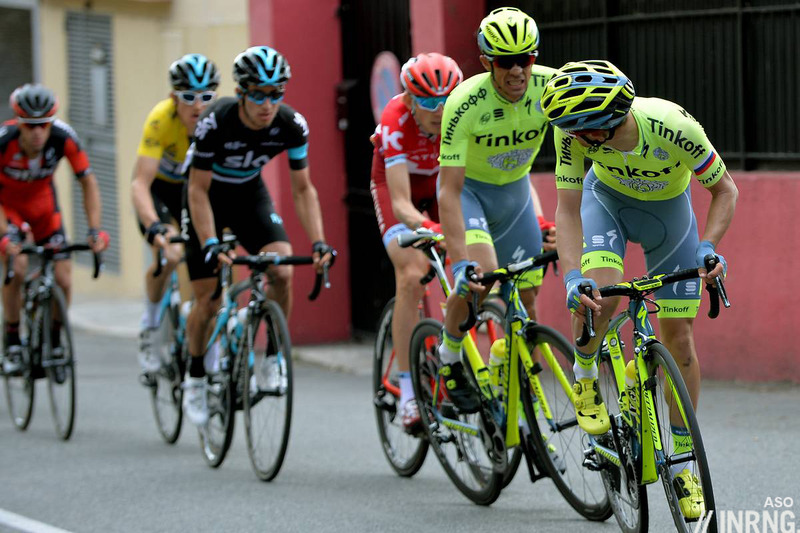 Thomas had to ride to his limits and Contador and Tinkoff put Sky on the ropes. It was exciting but as remarked at the time Contador still lost Paris-Nice to one of Froome’s domestiques, it wasn’t the psychological advantage he needed. The Spaniard had a great spring with second place in the Volta a Catalunya and victory in the Tour of the Basque Country. So far so good but he’d crash and get ill in the Tour de France and if his chances of an eventual win seemed unlikely in hindsight perhaps he’d have spiced up what proved to be a dull dish in the crucial moments; certainly a podium finish might have been within reach. Come the Vuelta and Contador as a catalyst to the action, notably on the stage to Aramón Formigal but he didn’t get a stage win and finished fourth overall. Much was made of Thomas’s transition away from the classics to stage racing but 2015 had already seem him thrive in stage races. 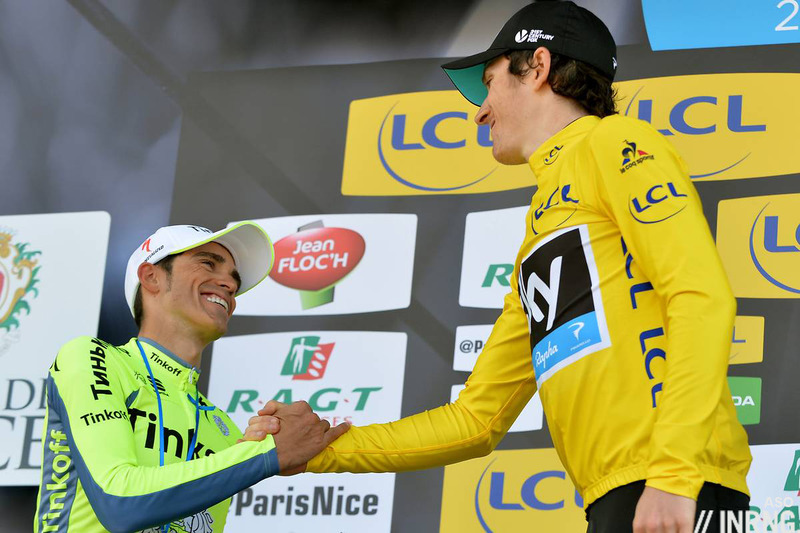 Paris-Nice suited Thomas perfectly, not too mountainous and he assumed the role of helper for Chris Froome later on. He’s a versatile rider who can fill the lieutenant role but leadership at Team Sky for 2017 is already being claimed with Mikel Landa aiming for the Giro and Froome likely to aim for the Tour-Vuelta double leaving Thomas to continue the understudy role and picking smaller objectives. Looking at this early season race we saw Ilnur Zakarin win a stage and he’d go on to match Nairo Quintana in the mountains of the Tour de Romandie and was close to the podium finish in the Giro before a horror crash took him out on the final Friday but he recovered and took a stage win in the Tour de France. Ion Izagirre had a good race but in the style of what we could call a “Moto 2 rider”, often in the second group on a mountain stage rather than making the moves and this steady riding earned him plenty of points, enough to make Bahrain-Merida buy out his contract from Movistar and presumably pay him handsomely. At the other end Andrew Talansky’s troubles were there and the hype about Pierre Rolland’s improvement now he’d swapped Europcar for Cannondale had a cold shower in the prologue. There was also the absence of Fabio Aru who was down to ride this as part of his path to the Tour de France but pulled out and his season never came together. Finally a sad note because the stage ended on the Promenade des Anglais, always a convivial host to the race and an urban, opulent setting to what is often a rural sport but this location is now indelibly associated with the atrocity on 14 July when a murderous coward drove a truck into a holiday parade and opened fire to kill 86 people. Why the highlight? plenty of action and tactics where the result went down to the final seconds. Contador’s bold tactics show how to take on Team Sky and if he lost here then similar tactics would undo Team Sky in the Vuelta. I don’t see any single team or indeed rider capable of surprising SKY or Froome for the next few years in a the most important three week race. Only Sky themselves, by their inept tactics/inattention can loose the TdF. In a one week race anything is possible, and often results can favour the strong and brave. Teams tend to be more evenly matched, and there is less time available for the dominant teams to retrieve mistakes. As Inrng points out, temas did surprise Sky at the Vuelta. You would however expect them to not let that happen again – everybody at the front for the start on time please. Enjoyed this race. The gravel stage was tense even if it didn’t actually cause much damage in the end to the overall result it certainly made it worth watching. Thomas owes a big debt to Sergio Henao as well as Tony Gallopin for getting back enough time on that final stage. Henao was a big help to Thomas all weekend, good point. Gallopin was there for the descent into Nice and joined in the chase which I seemed to remember drew some surprise from people because Wellens was ahead but it helped keep Gallopin and co away from the chase behind them and Gallopin appears to be friendly to Thomas too, perhaps hoping for some help in return one day? Having seen Contador do something fairly similar to Rodriguez in 2012, this move shouldn’t have been that big a surprise. Not only should Froome have anticipated this possibility, but he failed to react decisively once it had happened – incessantly talking on the radio rather than immediately chasing down the gap before it got too big. Brailsford gloated before the stage that there are two types of rider – those who know how to use a powermeter and those who don’t. Maybe those in the know are lacking the ability to think for themselves. It would be nice to see a rider other than Contador show some nous and bravery at the Tour. It does appear that way at the minute, but who knows when the next big thing will appear? Pre-2011 Vuelta Sky almost dropped Froome, five years later he’s a three time TdF champion. Sport can appear certain then change quicker than anyone imagined. Because dominance in the recent past means a simple, predictable reiteration in the near future. Yes – cycling, like sport, like life, always works that way. Great write up as ever inrng! The final stage of the race to the sun was thrilling. I was on the edge of my seat all the way down that final descent. Amazing ride by Thomas. Full credit to Henao for his support! This afternoons announcement by the major race organizers to reduce teams from 9 to 8 in Grand Tours and from 8 t0 7 in their other events could really make a difference. This should have a greater effect on one week and one day races. All we need now is some imagination on route design and the banning of ‘radio control’. It’s good to see the organizers take the initiative, rather than waiting forever for the governing body. I’ll do a separate piece on the 9 > 8 plan soon as it’s generating quite a few questions at the moment. It’ll have some effect but not much, to take this Paris-Nice stage as much as it reduces Team Sky’s chase it also means fewer riders for Tinkoff to send up the road while retaining some to help Contador until he launches his move (shelter, fetching food etc). Whilst the season started well for Thomas, it oddly seemed to taper off and he never hit the heights of 2015. Maybe personal life, wedding etc. Let’s hope he returns next Spring and has a tilt at the cobbles again. This race, however, was another season highlight, both for us and Thomas himself. I remember in a post race interview with Thomas, that he said they had fitted a larger Chain Ring, specifically for the descent. Good planning or the luck of the draw? Was there anything in Tinkoff’s claims (I think it was Yates?) that Thomas/Sky had a motorbike in front of them for long periods, whilst with Contador et al the motorbike was behind? Good answer. You’re on a roll this evening. I didn’t notice it at the time and only looked at short bits to see if there was anything in it. The motorbikes were positioned as Yates said, but I didn’t watch for long enough to see if they were significantly close and for significantly long periods. Thought Inner Ring – or someone else – might have. No conspiracy was implied – certainly not by me and not by Yates from what I recall – it was just that that’s where the motorbikes were. With a important stage ditched due to weather worries (I seem to remember some controversy as to whether this was really necessary?) this was for me what the Brits would call a “damp squib”. I understand it could be a season highlight if you’re a big fan of SKY and/or Thomas, but since I’m neither I wouldn’t include it in any sort of highlight list. This cancellation for weather seemed a lot more necessary than the one at Tirreno – being as it was actually snowing and that the decision wasn’t taken the day before, whilst based on conflicting weather forecasts (and with no alternative route used). It is not about the result rather the process. Contador enlivened the race (again). I think from a sporting perspective it does not matter whether someone likes Sky or not, they are a dominant force in the stage races that’s a fact. Some racers try to play it safe and hope for some divine intervention while others are trying different tactics to unlock the races. Contador and his team are one of the latter. Some might say it’s a pity that Contador missed the win by just 4 seconds, but that stage was entertaining and full of suspense until the very end. I think that’s the most important. Exactly, it was the racing not the result that was the highlight, action from start to finish and a lot of tactics and teamwork along the way. The whole race was in play right until the end. Indeed, I saw only black and white…oh, and some great racing. Nice reminder of a Nice highlight. One of those races where as they say form is temporary, class is permanent. 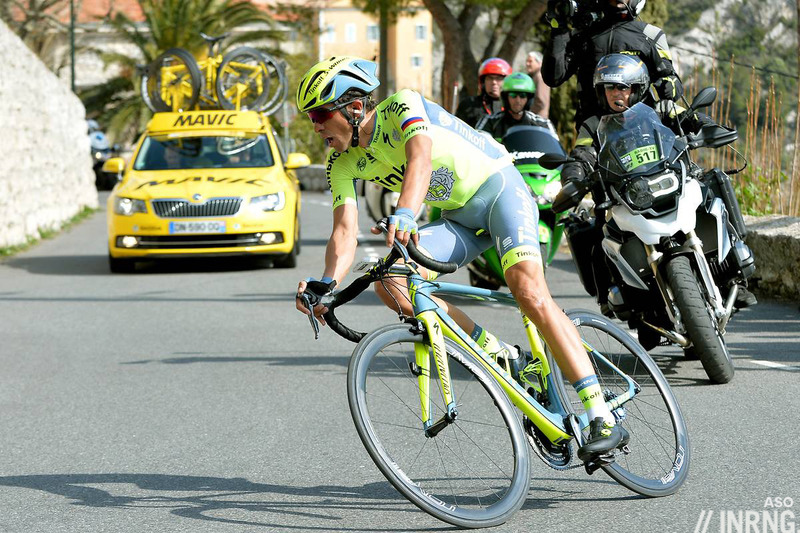 Contador seemed to do more than enliven the race, he was a force of nature, only one with tired legs. Loved this stage and was gutted to see his attack fail to get quite enough seconds. Brilliant attacking riding – I’m very glad he’s not retiring. Great pick! That stage was my highlight of the year. It was only besmirched by the generous helping of some TV motos Sky benefited from when chasing Contador and his team mates. At some point the gap closed incredibly fast. Well, incredibly only if you did not take into account why you were treated by continous close-up shots of Nico Roche’s face. Still it was great racing and once again an exciting viewing experience like this was given to us by Mr. Attack himself. It’s a shame he did not succeed.